The political parties in Mexico constitute a variety of perspectives across the ideological plane. There are more pragmatic catch-all parties or more ideologically driven ones that hold strong positions on specific issues. Some of the parties have existed for over 75 years while others appeared just recently. Currently, there are nine national political parties with representation in Congress. The following figures show which party governs each state in the country and the political distribution of Congress after the 2018 election. Source: Elaborated by the Mexico Institute with data from the National Elections Institute (INE). Below you will find a brief summary of the different political parties in Mexico ordered chronologically according to their date of establishment. The PRI is the party that evolved out of the Sonoran generals’ winning coalition from the Mexican Revolution (1910 – 1920). The PRI has been identified by political scientists as a catch-all party, a term used to describe pragmatic political parties that mutate their stances on multiple issues over time and may even have contradictory positions in different regions of the country (i.e. when the PRI in Mexico City was in favor of abortion and against it in Tlaxcala ahead of the last presidential election). The PRI are usually midpoint oriented (center in the economic left-right spectrum and neither conservative nor liberal in social terms) as it allows them to maximize the number of voters that may identify with the party. This pragmatism allowed the PRI to create a political structure that incorporated many different groups, developing clienteles along the way that allowed its dominance over Mexican elections for over seven decades. Originally founded by President Plutarco Elias Calles in 1929 under the name National Revolutionary Party (PNR for its Spanish acronym), it then changed its name to the Mexican Revolutionary Party (PRM for its Spanish acronym) during President Cardenas’ term during the 30s. By the 1940s, it finally adopted its current name under President Miguel Aleman, becoming the hegemonic political party that governed Mexico uninterruptedly from 1929 to 2000 (and is currently the incumbent government since 2012). After their defeat in 2000 by the PAN, the PRI took two sexenios (6 year-term used to describe a president’s tenure) to regroup and mount an election campaign that was successful at reclaiming the presidency, even though it continued to hold a majority of governorships during those years. Enrique Peña Nieto, former governor of the State of Mexico, became president, rallying the support of voters under the promise of an “efficient State.” In its first two years in office, his administration proved successful at furthering their agenda through Congress thanks to the “Pact for Mexico” agreement between his party the PRI, the PAN, and then-strongest left party the PRD. Thirteen constitutional reforms were approved in a very strong start for a new government. However, the continuous flops (i.e. their late reaction to the disappearance of the 43 students in Ayotzinapa, Guerrero in 2014 or the across-the-board criticized invitation of Republican presidential candidate Donald Trump to the president’s house) and the multiple corruption scandals involving his family, his administration and PRI governors have undermined voters’ confidence in the PRI costing them several governor races over the last couple of years. Currently the PRI holds 41 percent of the seats in the Chamber of Deputies, 43 percent of the Senate, and 14 out of 32 governorships. In 2018, the PRI lost the presidency and the two (out of nine governorships up for grabs) they controlled (Jalisco and Yucatan). Combined with the very disappointing results in Congress and state legislatures, this was the PRI's greatest defeat in history. The PAN was founded in 1939 by Manuel Gomez Morin as a center-right wing political party that was opposed to the government’s more socialist agenda under President Lazaro Cardenas. It traditionally has been associated with the Catholic Church in many of its social positions (i.e. abortion, gay marriage, etc.) while also a defender of free-enterprise and free markets in the traditional economic ideological spectrum. Even though the PAN won its first deputy races in the 1940s, its presence was marginal until the mid-1980s when some of its candidates started winning important mayoral offices in several prominent (northern) border cities due to the unpopularity of the ruling party (PRI) after the 1982 debt crisis. By 1989, the PAN reached its first milestone, becoming the first party other than the PRI to win a governor race, by winning the governorship of the state of Baja California with Ernesto Ruffo. That victory propelled the PAN forward, winning other governorships during the 90s, such as in the state of Guanajuato with Vicente Fox. Several years later, in 2000, Fox would be the first opposition candidate to win the presidency of Mexico since the creation of the PRI after the Mexican Revolution. The PAN would hold unto the presidency in 2006 when Felipe Calderon barely defeated Andres Manuel Lopez Obrador by a 0.56 percent margin. However, despite moderately successful economic growth, Calderon’s presidency was engulfed in the turmoil of the conflicts with organized crime –the drug war –that escalated casualties to around 100 thousand deaths in six years, costing them the presidency against Enrique Peña Nieto from the PRI in 2012. During this administration, the PAN was instrumental for the approval of much of President Peña Nieto’s reform agenda as they voted with the government on most of the reforms, most notably the education, telecommunications, and the historic energy reform, while voting against the fiscal reform, considering it detrimental to the private sector. However, since the 2015 midterm elections, the PAN has opposed the PRI, rallying against the incumbent government in its multiple corruption scandals (whether involving the president’s cabinet members or the PRI’s governors). This favored them in many state elections, where they won states they had previously never governed such as Durango and Veracruz. Currently, the PAN holds eight governorships alone (and four in alliances with the PRD), controls 22 percent of the Chamber of Deputies’ seats and 30 percent of the Senate. In 2018, the PAN kept governing 3 states (out o the 9 possible) although they lost Veracruz and regained Yucatán (as well as defending Guanajuato and Puebla). The PRD was the first left-wing party to unite many of the different left-wing groups that existed in Mexico. It traditionally has supported more center-left socialist policies (i.e. central government planning with a focus on social spending programs for poverty alleviation) but, in recent years, it has also adopted more socially liberal ones, particularly in Mexico City, like allowing abortion, gay marriage, and furthering some green policies like alternative transportation modes (i.e. public bicycles and more buses like the Metrobus). It was created in 1989 by Cuauhtemoc Cardenas, Porfirio Muñoz Ledo, and several other political figures that split from the PRI after they were unsuccessful at convincing former President Miguel de la Madrid (the de facto leader of the PRI) of introducing some democratic reforms into the PRI’s 1988 presidential candidate selection process. Their group, the Frente Democratico Nacional (National Democratic Front), mounted a very successful presidential campaign (in an election that many consider to have been fraudulent as the Interior Minister controlled the election’s regulatory commission, making the government judge, jury, and executioner) where Cuauhtemoc Cardenas came close to defeating the PRI’s candidate, Carlos Salinas de Gortari. After the election, the members of the National Democratic Front created the PRD with many people joining from other smaller left-wing parties like the Mexican Communist Party. During the 1990s, their growth was smaller than the PAN’s, but they won the Mexico City mayoral race in 1997 (and have held on to it since then) with Cuauhtemoc Cardenas. Controlling the most important entity in Mexico has allowed the PRD to develop a strong support base that has propelled its mayors to being presidential candidates on two occasions: Cuauhtemoc Cardenas in his third attempt in 2000 and Andres Manuel Lopez Obrador in 2006 and 2012 (after then-mayor of Mexico City Marcelo Ebrard conceded in favor of Lopez Obrador’s candidacy). However, the multiple groups that compose the left side of Mexico’s political spectrum have been in constant conflict for the control of the party to the point that a great secession created the MORENA party in 2014, considerably weakening the PRD’s political aspirations. In the midterm elections of 2015, the PRD lost eight of the 14 (out of 16) delegations (boroughs) of Mexico City they governed to MORENA, putting its stronghold on the Mexico City mayoral government in 2018 in serious jeopardy. This has precipitated the possibility of a presidential alliance with the PAN, an alliance that has been successful at winning governorships seven times in the past. The PRD lost 3 of the 4 states it governed including the very important Mexico City. Additionally, its Michoacan governor decided to publicly support the PRI presidential candidate during the campaign, something that the party leadership indicated put him in grounds of expulsion. So, most likely the PRD lost its 4 governorships in this election. One of Mexico’s smaller parties, the PT is a radical left-wing party that ironically was founded by several groups of former left-wing PRI organizations in an attempt by the Carlos Salinas administration to weaken the PRD’s voter base in the early 90s. However, since the late 90s, it has allied with the PRD in elections, including the last three presidential races. Even though it has sometimes nominated its own candidate for different positions, most of the PT’s successes have come from alliances with other left-wing parties. In 2015, it did not reach the three percent threshold to keep its political party registration. However, after the election in a district of the state of Aguascalientes was annulled, an agreement with the PRD and the Citizen Movement Party (Movimiento Ciudadano) –through which they declined and supported the PT candidate –allowed the PT to barely pass three percent in the national vote and keep its registration. The PT currently does not hold a seat in the Chamber of Deputies (as it had lost its registration and consequently was not allowed to receive any seats that came from the proportional representation voting rule), but controls five percent of the Senate (from its vote in the 2012 federal election as senators are chosen for six-year periods), and has no governorships. The Mexican version of a green party has grown in electoral preferences over the last 20 years based on a pragmatic position of developing strategic alliances with bigger parties like the PRI and the PAN, somewhat adopting those parties’ agendas while in alliance with them. With this in mind, this party has been associated with free enterprise and the private sector-to the point it was suggested that it hosted the “TV caucus” within Congress as in their ranks they had several people closely linked to TV businessmen, such as Senator Ninfa Salinas, daughter of TV mogul Ricardo Salinas Pliego-while also defending some populist right-wing positions (i.e. in favor of the death penalty for convicted kidnappers and killers), intertwined with more traditional green party policies that attempt to protect ecosystems from pollution or predation. The Mexican Green Ecological Party (PVEM for its Spanish acronym) was originally founded in 1986 by Jorge Gonzalez Torres as the Mexican Green Party (PVM for its Spanish acronym) and rallied along Cuauhtemoc Cardenas’ National Democratic Front in the 1988 elections. By the early 90s, when it failed to reach the minimum threshold to keep its registration, it changed its name to the current one for the 1994 federal elections and eventually survived the cut-off point. Since then, its continuous growth-becoming Mexico’s fourth largest party-can be explained thanks to its alliance with the PAN for the historic 2000 presidential election, and after feeling cheated out of their agreement with Vicente Fox, their continuous alliance with the PRI since the 2003 midterm elections. By 2012, the PRI rallied behind the PVEM’s candidate for the governorship of the state of Chiapas, Manuel Velasco Coello, a former PVEM legislator who is the grandson of Chiapas’ former PRI governor Manuel Velasco Suarez. Currently, the PVEM holds eight percent of the seats in the Chamber of Deputies, five percent of the Senate, and the governorship of the state of Chiapas. In 2018, they will most likely compete alongside the PRI for many offices and have to defend the Chiapas governorship, which is up for election. The PANAL was created in 2005 under the leadership and oversight of Elba Esther Gordillo, the teacher’s labor union leader and former Secretary General of the PRI who split from the party in 2003. Since then, the party has given spaces to both union leaders and Gordillo family members. They have a history of allying with bigger parties, making it hard to distinguish the policies they defend from the agenda of the parties they are in alliance with. However, in the 2012 elections, they presented Gabriel Quadri as their presidential candidate, mounting a successful campaign around liberal issues –liberal in economic terms as he supported free markets, while also being liberal in social terms with several green policies that supported the environment, fighting greenhouse gas emissions, and favoring minority rights –that allowed them to keep their registration as they got more than the two percent needed in that election. When, in 2013, the Mexican government captured Gordillo under the accusation of extensive corruption and various criminal activities, the presence of the party in public discussions diminished, but thanks to their multiple alliances with the PRI (and occasionally with the PAN in some states) they kept their registration. Currently, they hold two percent of the seats in the Chamber of Deputies and have no senators, as their only senator, Monica Arriola Gordillo (the late daughter of Elba Esther Gordillo), died of brain cancer in 2016 and her replacement, Manuel Fonseca, quit, becoming an independent senator. They have no governorships, although they supported Puebla’s governor Antonio Gali who is a PAN candidate and won the 2016 election. Formerly known as Convergencia (Convergence), MC is a small left-wing party that was founded in 1999 by former PRI governor Dante Delgado, other former PRI members, and several other civil society groups. It has been associated with social-democratic policies as it behaves like a center-left party, but is also willing to take pragmatic positions and support candidates who were right-wing PAN members before, such as Fernando Elizondo in the state of Nuevo Leon or Guadalajara mayor Enrique Alfaro in the state of Jalisco. During the 2000s, Convergencia ran in alliance with the PRD and PT in most election races, obtaining more than the 2 percent of the votes needed to keep its registration, but it was not until they supported the popular Enrique Alfaro that their growth in Jalisco was translated into a higher national vote. Seeking to increase those numbers, they invited former mayor of Mexico City (and former PRD member) Marcelo Ebrard to lead their Chamber of Deputies caucus in 2015; however, a court resolution impeded them to register Ebrard, who remains without a party. Currently, MC controls four percent of the seats in the Chamber of Deputies, has no senators (as their only senator, Layda Sansores, quit and joined the ranks of MORENA), and holds no governorships. Nevertheless, the rising popularity of Enrique Alfaro in the state of Jalisco could score MC its first governorship in 2018. The birth of the left-wing MORENA in 2014 came as Andres Manuel Lopez Obrador (AMLO) led an exodus of party members from all left-wing parties into a new political party that–in his words–truly represented the ideals of the Mexican people and not the ideals of the “mobs in power.” In its short lifespan, MORENA has indicated that they favor a relentless anti-corruption agenda and has defended policies traditionally associated with a harder left-wing party than the PRD (i.e. favor labor unions or being strongly against the liberalization of the energy market) without necessarily embracing the more socially liberal positions that its center-left predecessor has furthered (i.e. consider putting LGBTTTQ marriage and adoption rights to a referendum instead of supporting them). Nevertheless, it has been criticized by prominent left-wing political figures like Cuauhtemoc Cardenas for saying they are strongly against corruption (labeling every other party as part of the “mobs in power”) but welcoming to the party politicians with less-than-stellar pasts in that department (i.e. Cuauhtemoc borough head in Mexico City Ricardo Monreal, whose administration has been denounced by several business people for extortion; Eva Cadena, a Veracruz legislator caught on tape twice receiving money for MORENA’s campaign; or even Senator Manuel Bartlett, who in 1988 was the Interior Secretary responsible for the electoral commission that is believed to have committed electoral fraud against Cuauhtemoc Cardena’s presidential campaign, altering the results in favor of the PRI’s Carlos Salinas) as long as they support Lopez Obrador. MORENA’s political agenda is very closely linked to Lopez Obrador’s own agenda, as the party is so strongly dominated by his presence that he is the only guaranteed candidate to participate in the 2018 presidential elections. Precisely, it has been AMLO’s political stature that has boosted several MORENA governor candidates (like Delfina Gomez in the 2017 State of Mexico elections) to be competitive in several races. However, it seems to have been a good strategy as, in its short years of existence, MORENA is the party that has grown the most in this term. In the 2018 elections it had an impressive showing winning almost everywhere it competed. The "maroon" tsunami that Lopez Obrador spearheaded won him the presidency of Mexico, majority in both chambers of Congress (being close to supermajority levels), 4 out of the 9 governorships of for grabs (including the very important Mexico City), has majority in 19 out of the 32 state legislatures as well as dozens of mayors in many states. The newest party in Mexico, the PES, obtained membership to the national registry in 2014. It has been associated with a more traditionally Christian ideology, and, in fact, it has been accused of including religious ministers as presidents in their gatherings, a situation prohibited by Mexican electoral laws. This party defines the family (defined in their terms as the union of a man with a woman) as the center of their policies, being openly anti-abortion and pursuing many conservative policies. Nevertheless, this party is much more pragmatic than its ideology would suggest. For the sake of keeping their registration, they have made alliances with different parties that do not necessarily share their same positions. 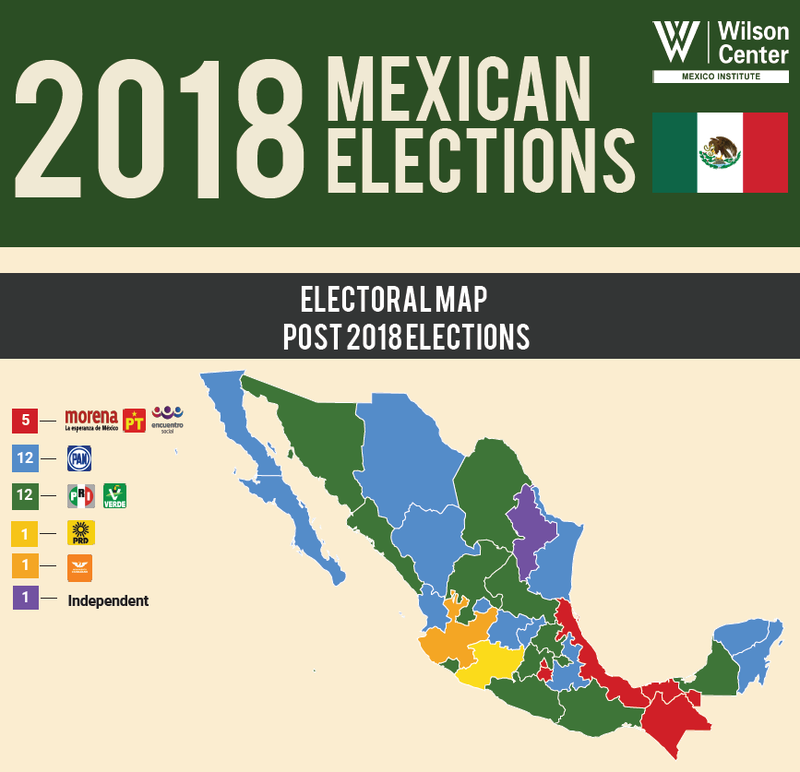 Since the 2015 midterm elections, PES has formed an alliance with the PRD, PT, and MC in Michoacan with Governor Silvano Aureoles' candidacy, and with the PRI, PVEM, and PANAL in the State of Mexico with Governor-Elect Alfredo del Mazo. Currently, it holds two percent of the seats in the Chamber of Deputies, but has no Senate seats or governorships. In the coming election, the main challenge for PES is to get a three percent share of the national vote in order to survive.